Utahredrock: Design decision: Leave adobe bricks exposed? The entire house, both interior and exterior walls, is built from double-wide large adobe bricks. An adobe brick is simply dried mud. If you drop it from as low as two or three feet to a solid surface, chances are good the brick will shatter into dust and smaller chunks of dried mud. It's shocking that these old houses are made from this material, yet this house has been standing for over 150 years. 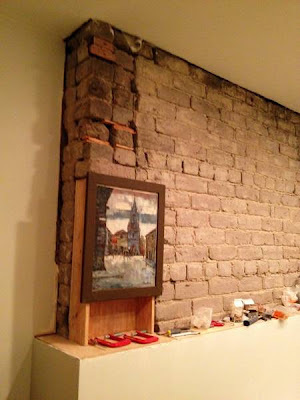 As I gutted the place during the remodel I uncovered many brick walls. Initially I thought I'd leave a few exposed, but since adobe bricks are so fragile (and dirty) I covered them all back up except for a section of wall in the kitchen. 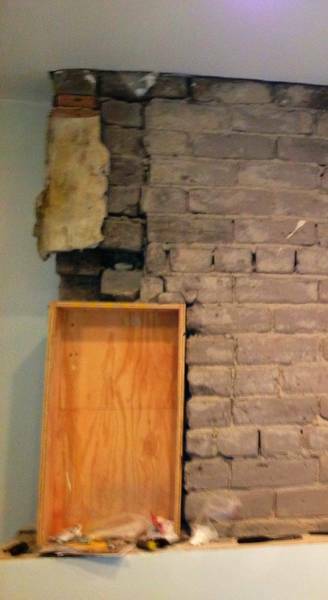 I like the different look, texture, and feel of the exposed brick versus just more drywall or plaster. Yet the wall needs work--part of it needs to be rebuilt and mortar repairs are needed throughout. Also, if you leave adobe exposed it must be treated with a chemical or resin to create a harder surface and prevent deterioration of the exposed mud bricks. Another reason I have for leaning toward leaving the wall exposed is it serves as a "truth wall." In straw-bale constructed homes (straw is a highly energy efficient material for construction) it's a common practice to leave a truth window so people can see the material inside of a wall. Since my whole house is built from these adobe bricks it's cool to actually see some of them. The end of the exposed brick wall in the kitchen has looked like it was about to collapse for the past six weeks or so. I was afraid to touch it. It's a load bearing wall and I didn't want to create some sort of collapse, even though the section of concern was clearly bearing no weight. Last night my friend Bob suggested wood shims and an extra brick where one was missing. Like magic the wall looked a little more complete and stable. More work needs to be done and in the end I may just skim the wall with plaster since these bricks are so unstable, but with this temporary fix I feel comfortable leaving it alone for a while.